These high-quality pluggers have a shape that closely matches the final root canal preparation. This maximizes condensation forces on the softened gutta percha without placing undue stress on the root canal system. 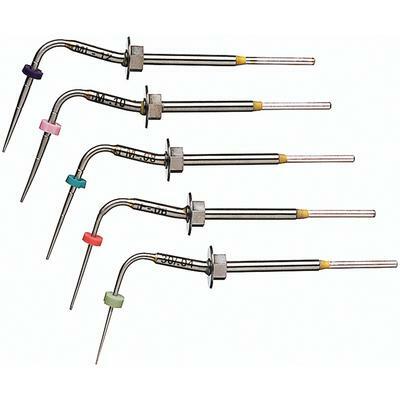 Because the System B Heat Source provides and exact temperature throughout the procedure, the Buchanan Pluggers do not over-soften the gutta percha and the warm mass fills lateral canals as easy as it seals apically. When you disengage the heat, the pluggers cool almost instantly and seperate easily from the condensed gutta percha. These will work with both the elements Oburtation Unit and the Traditional System Unit B.